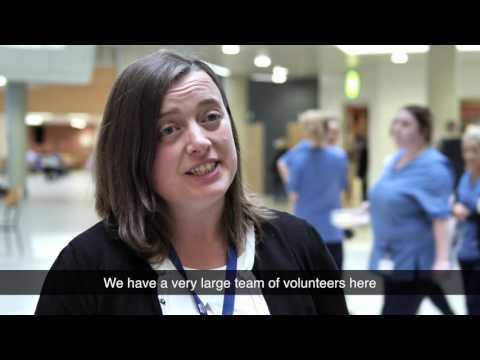 The Hospital opened its doors to the public in late spring 2015 providing an exciting opportunity for volunteers to be part of a fantastic Welcome Team committed to enhancing the experience of our patients and their visitors. The aim was to capture some of the fantastic spirit and energy of the 2014 Games and in particular the Host City volunteers. Our Volunteer Guides offer a friendly and helpful welcome to patients, families and visitors and guide them to where they want to go within the hospital, and the service has rapidly become one of the most successful volunteering programmes within the health board. There are over 100 volunteers in the team, supported by a dedicated Volunteer Manager, and each covering the main atrium on a 3 hourly rota from 8.45am to 5pm. Retention within the service has been fantastic, with most of the team now attending a regular QEUH Forum, where they can offer feedback/suggestions and also raise current issues/concerns from the patients and visitors they support.